The AGS, under a cooperative agreement with the National Highway Traffic Safety Administration (NHTSA), has published the Clinician’s Guide to Assessing and Counseling Older Drivers, a web-based educational project that walks clinicians through key issues, opportunities, and challenges faced by older drivers and the healthcare professionals who care for them. As a companion to the Guide, the AGS also produced live webinars to provide guidance to clinicians who treat older drivers. 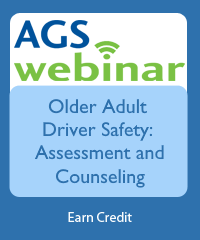 This webinar, Older Adult Driving Safety: Assessment and Counseling, is presented by two members of the Editorial Board that developed the Guide, Richard A. Marottoli, MD and Anne E. Dickerson, PhD, OTR/L, SCDCD, FAOTA. The webinar walks participants through case examples of the screening, evaluation, and intervention strategies for assessing and counseling older adult drivers. Participants can earn 1.0 AMA PRA Category 1 CME credit, December 12, 2016 through December 11, 2017.